BUT: in this last clean-up, I've discovered three perfumes worth sniffing. (Rendez-vous at 8 o’clock); mango, ginger, Clary sage, Naked Ladies (Amaryllis belladonna L.), vetiver. Treffpunkt 8 Uhr has a zingy opening of ginger and Naked Ladies (the flower, not some approximation of woman-smell); this unusual combo is joined by dry sage and a hint of green mango. I never dreamed a perfume could conjure the aroma of Naked Ladies (mine are about to bloom and I can't wait) but this one comes close. Naked Ladies emit a high-pitched, sweet aroma, about as "pink" a smell as you can get. The scent is a cross between floral and vinyl notes; it's very "Mod." The photo of the pink flower in the J.F. Schwarzlose image above is of Colchicum (also known as Naked Ladies but most often referred to as Naked Boys) which is scentless; go figure! As Treffpunkt 8 Uhr dries down, I continue to smell the flowers, and they're joined by some cologne-strength vetiver. The extreme dry-down is pleasant: a light floral musk. Treffpunkt 8 Uhr is not a powerhouse perfume but it lasts for half the day on me (and longer if you make sure to get some on your shirt). As for "gender," this hits the spot right between masculine and feminine. Try before you purchase. J.F. 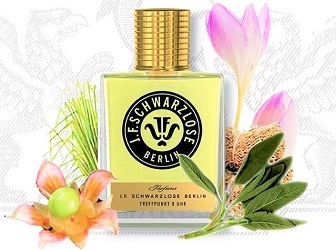 Schwarzlose Treffpunkt 8 Uhr is €129 for 50 ml Eau de Parfum. Absolue d'Osmanthe begins with rich osmanthus, which is quickly joined by a sweet accord — rose-infused "plum jam" (this fragrance reminds me of the early days, and offerings, of Serge Lutens perfumes). Osmanthus reasserts itself in mid-development, this time with a darker character: I smell leather, beautiful cedar and sandalwood and fruity/dense amber with lots of labdanum and vanilla. If you were lucky enough to smell the original Féminité du Bois by Shiseido you may recognize its vibrant ghost in Absolue d'Osmanthe. In its base, Absolue d'Osmanthe becomes drier with a hint of muskiness. Absolue d'Osmanthe: 100 percent unisex, 100 percent tempting me. Perris Monte Carlo Absolue d'Osmanthe is $180 for 100 ml Eau de Parfum. Mentholated bergamot and "crisp" cinnamon open Special for Gentlemen. A wonderful vintage aroma of cloves and lavender arrives next and is joined by a rich amber blend of moss, opoponax, vanilla and patchouli. Special for Gentlemen felt familiar on first sniff, but not in a bad way (its ingredients smell costly). Special for Gentlemen's scent reminds me of a shaving soap my father used when I was a little boy: masculine, spicy, "cool" yet hearty. Like Treffpunkt 8 Uhr, you'll want to be generous with Special for Gentlemen (a few sprays won't impress). 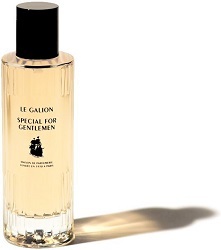 Le Galion Special for Gentlemen is €140 for 100 ml Eau de Parfum. Note: top image of the author's own Naked Ladies. I agree with you about Osmanthus – I have the Parfum concentration and it is amazing. I think this brand gets overlooked a lot, and their fragrances are very good quality. Clarissa…until I got my sample, I was unaware of the line, too. Clarissa…are there others I should try? “Rose infused ‘plum jam” sounds like an incredibly luxe spread for toast! Yum! J: it sure does! Good plum jam is so hard to find…make some and add some rose essence while you’re at it. I appreciate your wading through the piles of samples for us! Glad you found some to love, as well. I want to urge reader caution with the Schwarzlose line. I have their Trance, which sounded perfect, and it would be if the woody amber were about one-tenth the volume. I may be hypersensitive to these particular aromachemicals, but I think repeated testing before buying is critical. Some of them can smell stronger over time, too, as your brain/nose keys into them. Noz: interesting. This is the only one I’ve tried from the line and I’ve worn it just a week…but no discernible increase in strength. But EVERYONE here tries before they buy, right?????? HA! Thanks for the review Kevin! I’ve only tried the Absolue d’Osmanthe in both edp and extrait. I think it’s beautiful but I have to be in the mood for its richness. (I also like their Essence de Pachouli). And only 3 samples out of that many that are worth talking about?! Depressing. Elisa: yes, many are been-there, done-that. I give my samples three tries with time in between…then give ’em away. Happy to see you liked the Osmanthe! I happily own a bottle. I really enjoy Rose de Taif too, I definitely think it’s worth a go if you haven’t smelled it. Oh, I’ve got to sample the Treffpunkt 8 Uhr! 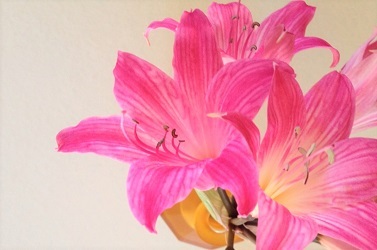 I would love to try a perfume that smelled like the Amaryllis belladonna in my yard. Mine smell like delicate floral bubblegum mixed with sap from green stems. Kind, isn’t it a great scent!? I look forward to that scent every year.